Why do some patients snore? What is neuromuscular disease (NMD)? What is hypoventilation syndrome (OHS)? NIV for COPD. Can it help? Why is it important to treat restrictive lung disease? 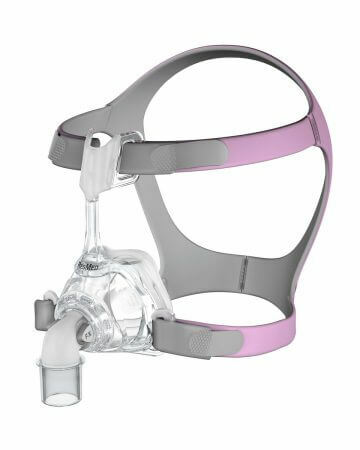 The ResMed Mirage™ FX for Her nasal mask is designed specifically for women, featuring a stylish pink headgear that comes in a smaller size. The mask’s Spring Air™ cushion is soft on your face, the flexible forehead support allows for dynamic fitting and adjustment, and the gentle strap even accommodates your preferred hair style. Comfortable. The form-fitting SoftEdge™ headgear is flexible and breathable, with a contoured edge that’s kind to your face. Easy to use. It’s made up of only four parts for effortless use, cleaning and reassembly. Easy to attach. The quick-release elbow allows you to detach from your device without having to take off the mask, so you can get out of bed and easily reconnect to your device when you return. Sized to fit.The mask incudes a smaller lightweight frame to provide a stable fit, and a smaller cushion to better fit your face. Are you having troubles with your mask? Do you have questions about fitting, cleaning or other mask-related topics? Find the answers to these questions and more in our patient support library. Quattro Air CPAP mask is the lightest full face mask on the market today, delivering quiet, comfortable and reliable sleep apnoea therapy. Designed to fit every face with ease, AirFit F20 combines innovative cushion design with easy-to-use features to deliver an outstanding experience for full face mask users. Fitting 99.4% of faces worldwide, AirFit N20’s blend of intuitive design and comfort-driven features is designed to deliver exceptional performance in a nasal mask. ©2000-2019 ResMed. All rights reserved. These cookies allow ResMed to analyze the website usage to measure and improve performance. These cookies are used to help better advertise depending on your interests. By closing the popup, your preferences are kept throughout the session, until you change them.